As a smart business person, you'd never leave a key in a vehicle you own, right? You know that a vehicle with a key inside is an invitation to a thief. Yet, the truth is many people do leave keys in vehicles. Here is a common scenario. It's an icy January morning and you are getting ready for work. Your company-owned truck is parked in your driveway. Your truck will be frigid on a morning like this so you decide to warm it up before heading out. You dash out the door, jump into the truck and start the engine. Then you drop the key into the cup holder and run back into the house. Five minutes later you walk out the door. Your truck should be nice and warm by now. You head to the driveway and stop short, staring in disbelief. Your truck is gone! A brazen thief swiped your truck right in front of your home! You are annoyed and angry, but you are also feeling a bit foolish. Leaving the key in the truck was a bad idea. Fortunately, your commercial auto policy includes physical damage coverage. You pick up your cell phone and sheepishly call your auto insurer. Incidents like the one described above are not uncommon. A report published by the National Insurance Crime Bureau ((NICB) in 2016 showed that 1,247,434 vehicles were reported stolen with keys between January 1, 2013 and December 31, 2015. The actual numbers of stolen autos are probably higher than the statistics indicate. Some victims were likely too embarrassed to admit they'd left the key in their vehicle. Vehicle thefts with keys are on the rise. As you can see from the table below, thefts of vehicles with keys increased each year from 2012 to 2015. *Numbers for 2012 came from the NICB's 2015 report. 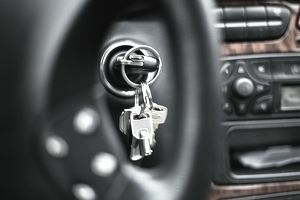 The rise in auto thefts with keys may seem surprising since vehicle thefts as a whole have declined substantially in recent years. The overall decline in thefts is largely due to technology. Modern cars are difficult to steal. Yet, car thieves are opportunists. Virtually any vehicle can be stolen if the keys are left inside. According to the NICB's report, more vehicles with keys are stolen during the late fall and winter than the spring and summer. This makes sense since more vehicles are left running when the weather is cold. Between 2013 and 2015, an average of 135 vehicles were stolen with keys each day. The NICB identified ten dates when thefts were particularly high. These are listed below. Note that all were in November or December of 2015. The NICB analyzed vehicle thefts with keys by model year. It studied thefts that occurred during the period 2013-2015. Not surprisingly, more older vehicles were stolen than newer models. Older vehicles are generally easier to steal because they lack some of the anti-theft devices found on newer ones. Vehicle thefts with keys declined with each model year between 2004 and 2009. Thefts rose for each model year between 2009 and 2013, and then fell sharply for the 2014 and 2015 model years. You can protect your vehicles against theft with a key by exercising common sense. If you warm up your car on a cold day, be sure to lock the doors. Alternatively, you can start your vehicle remotely. Special devices are available for this purpose, or you can use a smart phone equipped with remote-starting app.